GeAs (germanium and arsenic) was the semiconductor substrate material of choice long before the III-V series like GaN and GaAs came along. GeAs would be considered a III-IV semiconductor since Ge is in group IV of the periodic table (Ga is group III, As is group V). It is actually know simply as germanium. 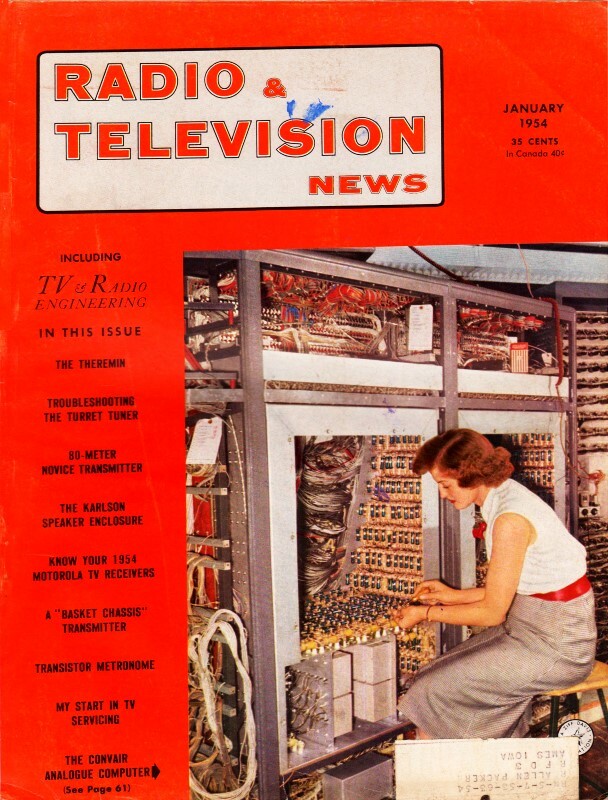 1954, when this advertisement from Bell Telephone Laboratories appeared in Radio & Television News magazine, was the same year that Texas Instruments (TI) introduced the world's first commercially available silicon (Si) transistor. The GeAs boule photo in the ad was printed "life size," which makes it around 2" in diameter. Compare that to 12" diameter wafers standard today for Si. Gallium nitride (GaN), a more exotic high frequency, high temperature semiconductor compound, just recently grew (literally) beyond a 2" diameter boule size where it had been stuck for a decade. Individual device sizes have decreased while wafer sizes have increased, so the number of devices per wafer is way up and the cost per device is way down. Germanium crystal grown at Bell Telephone Laboratories (life size). It is sliced into hundreds of minute pieces to make Transistors. Transistor action depends on the flow of positive current-carriers as well as electrons, which are negative. Arsenic - a few parts per 100,000,000 - added to germanium produces prescribed excess of electrons. With gallium added, positive carriers predominate. Latest junction type Transistor uses both kinds of germanium in the form of a sandwich. 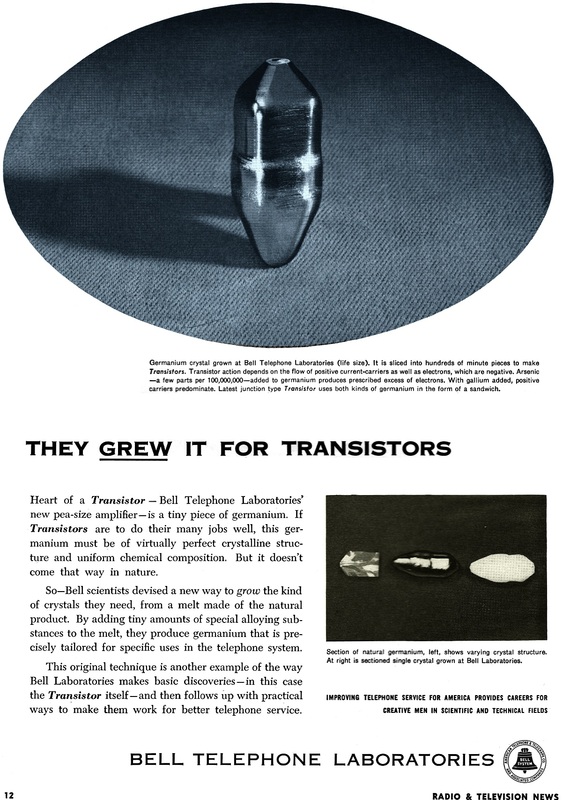 Heart of a Transistor - Bell Telephone Laboratories' new pea-size amplifier - is a tiny piece of germanium. If Transistors are to do their many jobs well, this germanium must be of virtually perfect crystalline structure and uniform chemical composition. But it doesn't come that way in nature. So - Bell scientists devised a new way to grow the kind of crystals they need, from a melt made of the natural product. By adding tiny amounts of special alloying substances to the melt, they produce germanium that is precisely tailored for specific uses in the telephone system. 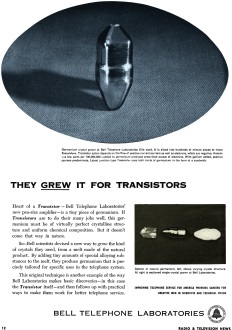 This original technique is another example of the way Bell Laboratories makes basic discoveries - in this case the Transistor itself - and then follows up with practical ways to make them work for better telephone service. Section of natural germanium, left, shows varying crystal structure. At right is sectioned single crystal grown at Bell Laboratories.